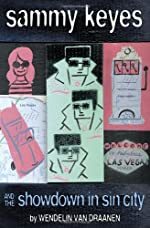 Sammy Keyes and the Showdown in Sin City by Wendelin Van Draanen. A Sammy Keyes Mystery. Review: Adventure, mystery, and humorous are three words that describe this outstanding book. This book is Sammy Keyes and the Showdown in Sin City, by Wendelin Van Draanen. This is a book that is part of a series, and the series is called Sammy Keyes. As you are reading you will witness the extraordinary things that Sammy Keyes will do to find out answers to all her questions. Sammy Keyes is nonstop in solving mysteries, but when it comes to solving mysteries in her own life there are some problems. She still has a bunch of questions not even close to being answered. Some questions are, who is my dad, is my mom really gong to marry my boyfriend's dad, how long is it going to be until someone finds out I'm living in my grandmother's room in a seniors- only building. Now, during an insane weekend in Las Vegas, Sammy Keyes just might find out the answers to all her questions. Will Sammy Keyes finally find out the answers to her questions? Sammy Keyes and the Showdown in Sin City has individual characters that made me want to keep reading. It teaches you how to solve mysteries, while adding some twists and turns on the way. Some ways it teaches you how to solve mysteries is that, you should ask people if they have seen or heard about anything that you are looking for. This book is for all audiences, but someone who is really in a problem and needs to figure some things out will especially appreciate the extremely intelligent information this book issues. Sammy Keyes and the Showdown in Sin City deserves five stars because it is full of action that will make you want to keep reading. We would like to thank Random House for providing a copy of Sammy Keyes and the Showdown in Sin City for this review. Have you read Sammy Keyes and the Showdown in Sin City? How would you rate it? 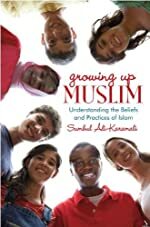 Growing Up Muslim by Sumbul Ali-Karamali. Review: What is it like to be Muslim? In Islam, children are raised very differently than in America. In Sumul Ali-Karamali's Growing up Muslim, you can find out what it's like to be Muslim. The book is divided into 3 sections, Muslim Beliefs and Practices (or, what it's like to grow up Muslim in California), When did Islam start and how did it develop, and Modern Muslim Demographics. It is a guide to the Muslim religion called the Qur'an, which is a book that most Muslims follow. There is an interesting story regarding a poor family that has sewn 40 silver coins into their son's jacket. When the family is traveling on public transportation, some thugs come and rob everyone on the bus. The robbers see the boy and they asked him if he has anything. The boy replies with "Yes," and shows the coins to them. Then the robbers asked why he told them about the coins. The boy responds by saying that if he lied, he would lie to God. I loved Growing Up Muslim. It was amazing to have a different perspective on life. I did not know about anything about Muslims and their culture until I read this book, I realized after reading it that my mind was filled with misconceptions about the Muslim people. This showed me a whole new life and how some Muslims actually live. Now I have a whole new appreciation for the Muslim culture. The story about truth and honesty caught me by surprise too. 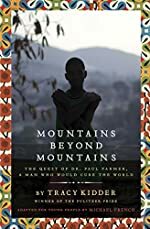 This book is great for anyone learning about another culture. We would like to thank Random House for providing a copy of Growing Up Muslim for this review. Have you read Growing Up Muslim? How would you rate it? Zigzag Zoom by Patricia Reilly Giff. The Final Book in the Zigzag Series. 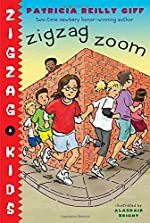 Review: Funny, adventurous, and athletic are just three words to describe an outstanding book - Zigzag Zoom by Patricia Reilly Giff, illustrated by Alasdair Bright. Zigzag Zoom is part of the Zigzag Kids series. As you are reading along, you will witness Gina attempt to get out of a running race. Gina goes to Zigzag Afternoon Center, and their mascot is the Zigzag Zebras. The Zigzag Zebras are going against the Timpanzi Tigers in a running race, and everyone at Gina's afternoon center thinks she is the best! Gina knows she would be way better at singing than running, and she knows Sumiko is the best. But she doesn't know how to convince them. The Zebras are getting ready, doing whatever they can to practice: running in the field, up and down the stairs, and running down the hallway after afternoon center is over. They have to win! But how? 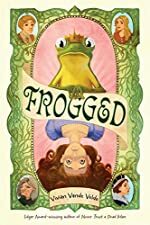 Zigzag Zoom has unique characters that will make readers want to keep reading! It teaches life lessons, but in an exciting way. Readers will learn that they can't be good at everything, but that they will never know if they don't try. The book is good for all audiences, but people who have a big race, or event coming up will appreciate the well-rounded ideas of this outstanding book, particularly for early chapter-book readers. 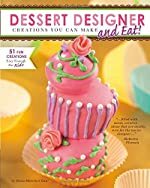 For someone who is having trouble with an activity that they are doing or need ideas for raising money, they can really receive some good information from this book. Zigzag Zoom deserves 4 stars, because it is lively and action packed, which will make you want to keep reading! We would like to thank Random House for providing a copy of Zigzag Zoom for this review. Have you read Zigzag Zoom? How would you rate it? The Whizz Pop Chocolate Shop by Kate Saunders. Review: Have you ever had magic chocolate that can make you live forever? In the book the Whizz Pop Chocolate Shop, written by Kate Saunders, that's what the evil gang wants. 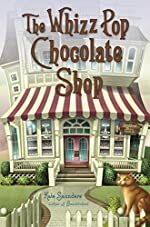 It's up to Oz, Lily, Caydon, Demerara (a talking cat), and Spike (a talking rat) to protect the chocolate, and keep the evil gang from changing chocolate forever! When Oz and Lily move into a new house over summer vacation, helping a government agency was the last thing they expected. They realize that there's a new event around every turn. They learn secrets that not even their parents know about. Eventually they discover the three uncles who were the magic chocolate makers. But, one became evil and killed his brothers with the intention of taking over the world - or at least, he does at first. Oz and Lily get help from a boy named Caydon. Even though Caydon doesn't know how he could help, Demerara knows he was useful. But as the adventure goes, on everyone realizes that they have an important part in the mission, even if they didn't think so at first. I really liked The Whizz Pop Chocolate Shop. Once you think that the problems have been solved and everything is better, another problem comes out of nowhere. This book held my interest the whole time I was reading, not once did I feel like the book was getting boring or that I wasn't excited to continue reading, and I never wanted to stop. I recommend this book to girls in 6th and 7th grades. I thought it was cool how this book has different characters like a talking cat and rat, witches, and magic chocolate makers. There aren't many characters like that in most books. I really like Oz and Lily. I like Oz because he's clever, helpful, and confident. I like Lily because she's nice, caring, and helpful. But she also has dyslexia, and that makes things a lot harder for her but she never gives up. I really enjoyed The Whizz Pop Chocolate Shop; it's full of adventure. It was very entertaining and fun to read. Have you read The Whizz Pop Chocolate Shop? How would you rate it? Good Night Baseball by Michael Dahl. A Sports Illustrated Kids Book. Review: Have you ever dreamed of catching a fly ball at a professional baseball game? Good Night baseball by Michael Dahl is a very cute read. This little boy is going to a baseball game in a big stadium and is very excited. When he gets there he sees tons of fans and friends all going into the stadium. It all starts when a boy and his father go to a baseball game and they see tons of people come from all over to see the game. They choose their seats carefully so they get a good view of the stadium they eat stadium food and then whack! The ball is going going gone right into the mitt of one very lucky fan. Good Night Baseball by Michael Dahl is a good story for little kids to use as a bed time story. For parents it's a nice short book to read to kids. Also I think it is a cute read because it rhymes. 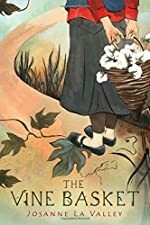 I'd recommend this book for 1st graders to 2rd graders to read with a bit of assistance but moms could read it to younger kids. I give Good Night Baseball 5 stars because it really gives you the real feeling like you're at the game. We would like to thank Media Masters Publicity for providing a copy of Good Night Baseball for this review. Have you read Good Night Baseball? How would you rate it? Infatuate by Aimee Agresti. A Guilded Wings Novel. Review: Angels, trouble, and love. Those words describe every bit of Infatuate written by Aimee Agresti. Haven, Lance, and Dante have to learn how to survive when demons are after them. 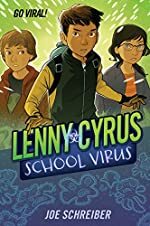 Haven, Lance, and Dante go to New Orleans for an angel "camp", and once they get there they learn not everything is going to be fun and games. There are people out in the world trying to kill them, demons. Haven and the others have to learn how to control their powers, as well as the others. Being in New Orleans is dangerous especially when demons are after you. This isn't the first time Haven has encountered demons, back in Chicago is where it all started. But first Haven and the rest of the angels have to defeat the demons so they can live their live as full angels. Connor, the angel's counselor, helps them prepare for the evil that lies before them. Haven must decide if she can trust Lucian again because he says he's good but he's on the bad side. Yet this isn't the beginning of the story, read to find out all the details on relationships and survival of Haven and her friends. I really loved this book because when you read it, it seems like you are Haven. The author uses secondary details to describe the primary details and it makes the story even more interesting. 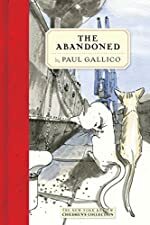 I would recommend this book for 4th grade or higher because this story is intense in some parts, such as when they are fighting or other things. If someone has an interest in angels then this book and series is meant for you. When you read this story you will feel just like the characters feel: sad, mad, angry, depressed, excited, and happy. Infatuate shows imagination but isn't too fantasy-like that you feel as in none of this could be real. This story in realistic fiction because the angels and demons are fantasy but the conflicts and feelings can happen any day. 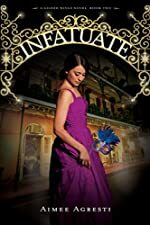 Overall Infatuate is amazing because it has exceptional details and it has an amazing setting and plot; and it's just a great story all around. We would like to thank Houghton Mifflin for providing a copy of Infatuate for this review. Have you read Infatuate? How would you rate it? Strike Three You're Dead by Josh Berk. 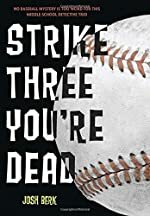 I liked this book for two reasons: I love baseball, and Strike Three Your Dead has a great crime investigation, and it has a lot of suspense. The book is really interesting, and it has a lot of details. My favorite part of the book is when Lenny and his friends have a strange and exciting encounter at the mall. Strike Three You're Dead is great for 5th grade through 7th grade readers. Have you read Strike Three You're Dead? How would you rate it?